4 independently-controlled 25,000 BTU burners.Independent manual controls to save the energy. Heavy duty cast iron grates for strong bearing performance. Build with a stainless steel exterior for long-lasting durability, and a full-length grease tray promotes easy cleaning. Adjustable and reliable stainless steel legs make it the ideal working height for your cooks. With heavy-duty cast iron grates that sit flush with one another, can easily slide pans around the range as needed. The grates are also removable for easy cleaning.Simple and reasonable structure, easy to manipulate and maintain. Investment casting burners, with stable flame, standby pilot.This countertop gas ranges are some of the strongest and most reliable ways to increase the output of your kitchen. Reliable and easy to use, great for fast-paced diners, concession stands, and food trucks, coffee shops, and other operations with limited work space. 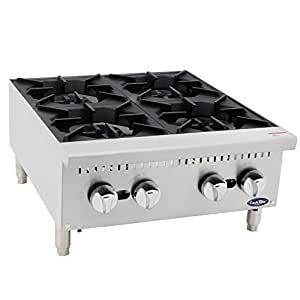 It’s engineered with a total of 100,000 BTU, featuring 4 burners that are operational with independent large knobs on the front panel, and versatile natural gas and liquid propane connections so that you can modify this countertop hot plate to best fit your needs! This model’s welded stainless steel construction gives it superior durability, and its 4″ legs and adjustable bullet feet allow you to match the height of your other countertop equipment for a clean presentation and easy use. Its heavy cast iron grates are removable for easy cleaning, you can easily slide pots and pans from one burner to the next without worrying about spills. This countertop hot plate is sure to become a go-to favorite! All 4 burners will turn on even if you only want to use one burner. Seems like a waste of natural gas, but useful for those who will simultaneously be cooking multiple items. This is a nice quality product. The finish look great and should last a very long time.Functions great.4 independently-controlled burners is really great design!